We took the boys to the lake for one last hurrah before school begins next week - that's why I haven't updated these last few days. The weather was perfect - we all had a great time! 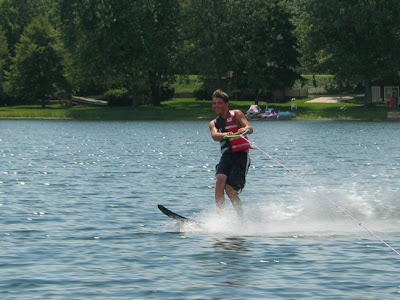 Jim learned to ski with one ski - and was hot-dogging around the lake. Joey was able to get some skiing in too - but preferred to do tricks on the knee board - on one of his last attempts to do a 360 - the knee board gave him a nice shiner for his birthday! Poor guy! 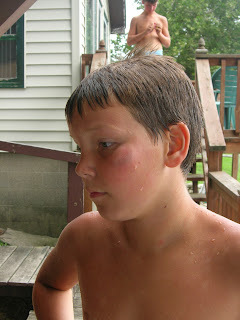 I hope his shiner is completely gone by the first day of school! Those are GREAT pictures! What a scrapbook page they would make! I'm sure your son likes his shiner. Boys always like those so they can tell some FANTASTIC story! Hope it heals quick though!! Oh my goodness, your boys sure can give a momma some sleepless nights! Love that water ski picture, get to scrappin' missy.